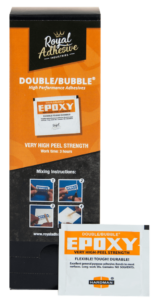 Royal Adhesive Industries’ DOUBLE/BUBBLE epoxies are strong and versatile. They contain no solvents, will not shrink, and cure at room temperature. Epoxies are effective over a wide range of temperatures for bonding to metal, glass, ceramics, wood, concrete and most hard plastics. They are cost-effective adhesives and do not include galvanic corrosion. A flexible, tough and durable vibration resistant adhesive. High peel and shear strengths. Bonds to polystyrene, ABS nylon, metal, wood, masonry and rubber. For repair of sports equipment, marine, aircraft, auto, truck and tractor parts. Excellent adhesive for grinding wheel hubs, door and window gaskets. A gap-filling adhesive for use in damp or moist environments. Cures and bonds under water. Bonds to stone, concrete, metal, glass, china, wood and fibreglass. Wet crack sealant and plumbing patch. For repairs of gutters, battery cases and boats. Excellent adhesive for use with fibreglass tape. Extra fast setting for quick repairs. Excellent adhesive for bonding. Repairing of tools, auto parts, electrical and electronic components, furniture and other applications requiring a fast setting adhesive. Extra fast setting, non-sag (thixotropic) adhesive for quick repairs. Bonds to wood, glass, metal, stone, ceramics and leather. Ideal for quick, permanent, vertical and overhead repairs. For fixturing, tacking, sealing, gap filling and staking in electrical and industrial applications. A machineable tooling and body patch that adheres to metal, wood and hard plastics. Can be machined, sanded, drilled and taped. Patching and filling voids and scratches in plastic and metal tooling, patterns and furniture. Royal Adhesive Industries’ Double/Bubble urethanes are strong, two-part, rigid and flexible adhesives with excellent resistance to tearing abrasion, wear and scratching. Quick curing, they are recommended for bonding metal, glass, ceramics, most plastics and flexible materials of all types. They contain no solvents and cure with very low shrinkage. Combines very high lap shear strength with good peel strength. For repair of urethane RIM parts. Recommended for repair of runner hoses and flexible electrical connections.